Sometimes in the world of personal finance, the focus can become solely concentrated on the “finance” part and neglect the “personal” dimension. I’m going to be starting a series of posts on most Fridays to delve into what that “personal” side often entails and will be using some of my own personal experiences with my sabbatical this year to help illustrate concepts and maybe even help you brainstorm your own goals and dreams. When I started considering what a transition out of active duty would look like, I realized it would be a very unique opportunity to do something I had been thinking about for awhile. Thanks to many people and bloggers in the FIRE (Financial Independence – Retire Early) world, I had been introduced to the concept of a sabbatical (or mini retirement) taken at varying points in your younger years. After all, why should everyone just work nonstop until they’re closer to traditional retirement age to only then have the time and money to try new things or travel more often? I’ve always valued experiences and travel over stuff so this idea made sense on several levels. While the military has generous amounts of leave/paid time off compared to many other jobs out there, I was never able to take more than 14 days off at a time much less consider a several-months long trip. In my new career as well, it would be unlikely given work requirements or future family obligations that I would be able to have this period of flexibility. When my wife, Sarah, and I started talking about the possibility of a sabbatical about 2 years ago, we realized we were in very good shape even then to make the possibility a reality. We had always been diligent savers, lived 100% consumer-debt free, and had a modest expectation for living expenses. With some additional savings set aside for the purpose of the sabbatical, we would be in great shape come 2018! We mapped out a financial plan which made a few tradeoffs by shifting some current spending for travel, eating out, and gifts towards the future goal of sabbatical travels. Another tradeoff was the opportunity cost of not earning much income during this time and this not saving as well. Considering this experience as a “mini pre-retirement” experience made that a worthy tradeoff to us even if it meant I would need to work around two more years later on than I would otherwise. As with many things in life though, circumstances change. My wife’s health declined over the course of 2016 before she experienced a health crisis event in March 2017. We lived in hospitals across two states for almost 6 months before we found out there wasn’t much else the medical community could do. In those final six weeks, we had so many special conversations that I will always treasure. In many of those talks, Sarah encouraged me to still go ahead with the plan for the sabbatical and use it to reflect, read, write, and prepare for my future. At the time and in the first few months following her passing in August, it was too painful for me to really think clearly about the future. However, as time passed and I worked (and continue to do so) through my sorrow and grief with my grief counselor and the invaluable support of my family and friends, I started to look ahead again. Sarah never knew a different life with me other than my serving in the Air Force so it has not been without challenges to fill in these details of what was supposed to be this new future for the both of us, but is now just me. Her boundless encouragement and selfless support throughout our entire marriage spilled over in those final weeks though as she shared with me her bright hopes for my future and her wise counsel for me. She knew just what to say and her insightful words ring now in my mind! Not many widowed spouses get to have such a blessing like I now experience in that way. God’s infinite blessings, grace, and mercy continue to be showered upon me, and I can’t wait to share with you all what He is going to do next in this new phase! My plan is now to be on my sabbatical over the next 8 months while I finish up my Certified Financial Planner (CFP) designation and also work on my Masters in Financial Planning. As part of this plan, I have purchased a truck and travel trailer (RV) to be able to travel all across the country spending time with family and friends as well as visit most of the National Parks out west. I’ll be sharing more here about this journey and what I’m learning as I go. I am also stepping into entrepreneurship and am thrilled to be launching my own financial planning firm this fall where I will be able to offer fiduciary, fee-only planning to a younger generation as a part of the XY Planning Network and expand upon my work here with Military Life Planning in helping servicemembers and their families. As I build this venture, I will create it as an all-digital business allowing me the opportunity to work and live geographically independent thus being able to travel and work from anywhere so I can spend more time with the people that mean so much to me. Even though this articles wasn’t primarily about finances, my financial situation is what is undergirding each of these opportunities to make my sabbatical a reality. Money is just a tool that we use to make our goals become real. A common trend I see among many people in their own personal finances is the disconnect between what they value (sometimes with a goal, but now always if they’ve not really thought about them before) and what they spend their money on. This is the recipe for frustration. I’ll be writing more on this particular aspect of behavioral finance in the future and the ways you can overcome this tendency we all often face. Even though I won’t officially start my full sabbatical travels in my RV until April, I’ve been traveling around a little bit already. 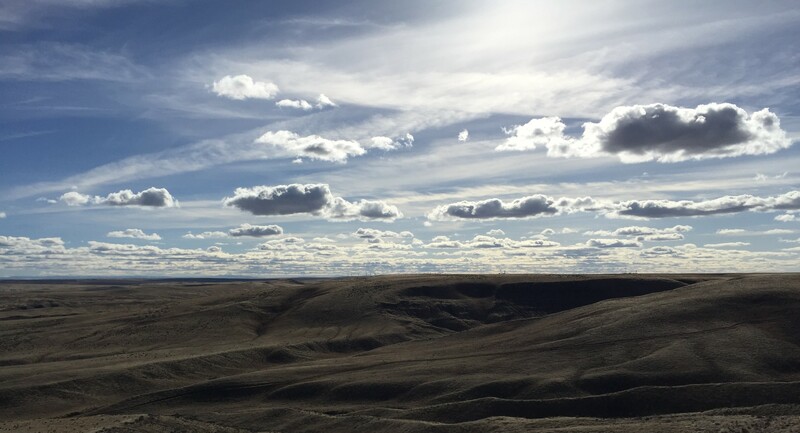 Earlier this week I stopped by the Fossil Beds National Monument in southern Idaho and captured the picture above which doesn’t even do justice to how amazing the view really was. It was a picture perfect day allowing me to see more than 65 miles to the south where the snow capped Albion Mountains were and also more than 50 miles to the north where the snow capped Sawtooth Mountains were. I’m standing on the bluffs overlooking the Snake River and you can also see some of the original Oregon Trail tracks still visible in the right side of the picture. As I reflected on the majesty and glory of nature, I was strangely reminded of the difference between urgent and important and how differently we often treat them. Don’t forget to stop and reflect on the difference too and be grateful even for just the ability to appreciate the beauty all around us. Appreciate the kind words Bob! Thankful I could share some of the lessons I’ve learned along this journey.